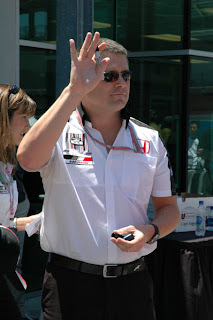 A while back we first heard the name "Takuma Sato" mentioned in connection with a potential IndyCar team headed by Gil de Ferran. Then it was "Scott Dixon". Now he's supposedly talking to "Graham Rahal". We don't know if this is serious because we don't know if there are any actual sponsors involved who would help pay for these drivers, but give Gil credit for mastering the USF1 method of dropping names to generate publicity for a team that doesn't actually exist yet. So which name is next to appear in a published de Ferran rumor? Danica Patrick? Sebastien Bourdais? Dr Jack Miller? Oh, and in case you've wondering where I've been the last few weeks I've been preparing to start my own IndyCar team. I'm considering partnering with Bill Gates and Warren Buffett as potential investors. Do you need an art director for your new business venture Jeff? that'd make my day ! Dang... just an IRL Team? I thought you were negotiating with the Hulman George's to buy whole series.